Pumpkin Patch! 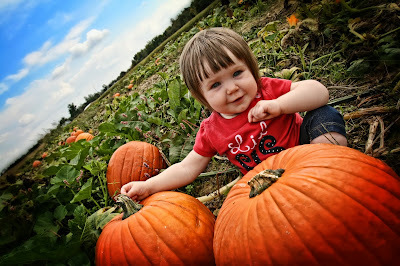 | Back Home Again: Pumpkin Patch! Saturday we went to the pumpkin patch, which is probably the thing I look forward to most about fall. The kids had so much fun too. We've always gone to the same pumpkin patch since we've been in Evansville but I decided to mix it up this year. Except, when we pulled up to the new pumpkin patch, we ultimately left because it didn't look like there was a whole lot for little kids. Unfortunately we broke Ewan's heart and he cried the whole way to the place we normally go to. He has been looking forward to this as much as I have and he thought we weren't going. Poor kid! We ate lunch there and then Ewan ran around and did all the kids activities. He ran around in the hay castle, found diamonds in the corn, went through the tunnel and went down the slide in the middle of the corn maze with his buddy Jack who goes to his daycare and just happened to be there at the same time. He also used a slingshot to throw pumpkins at Captain Hook and Peter Pan, which he talked about the rest of the day. That kids loves anything to do with Jake and the Neverland Pirates! Quite a difference compared to last year! The last thing we did was take a hayride out to the pumpkin patch to get our pumpkins. We did a photo shoot with Ewan the first time he was there, so Alan did the same with Cecily while Ewan and I picked our pumpkins. When we came last year, I was 37 weeks pregnant so Cecily wasn't quite around yet. The day was made even better by the fact that Ewan stayed dry the whole time and told us when he had to go potty the entire day. I haven't talked about it on here, but we're in the process of potty training him and this was the first time he has done that. So exciting! It was a really great day and I'm so glad both kids were able to have fun. It'll definitely be interesting next year when Cecily is able to run around with her brother! looks great! love the pictures. and I'm glad you're stealing my idea, lol! I love comparing how they looked at a certain age. It was all I could not to add even more photos! Poor little guy, thinking he wasn't going last minute. Awww! Those pics are adorable! He was devastated. So sad! pumpkin patch pictures never fail in their cuteness! love the pics!